The image is truly apocalyptic. 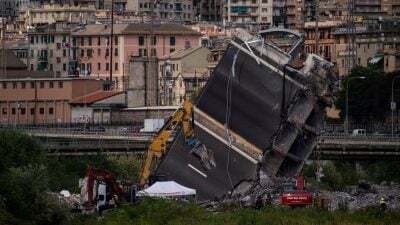 It looks as though a bomb has fallen on this stretch of road, which is a major artery – that is how a journalist described the Morandi bridge in Genoa just after it had collapsed, destroying the lives of dozens of people. These words bring to mind other images, those of about 40 Serbian bridges destroyed by NATO bombing in 1999 – among these the bridge over the Morava in Southern Serbia, where two missiles hit a train and massacred the passengers. For 78 days, taking off mostly from Italian bases supplied by the D’Alema government, 1,100 planes made 38,000 sorties, launching 23,000 bombs and missiles. They systematically destroyed Serbian structures and infrastructures, causing thousands of civilian victims. 54 Italian planes participated in the attacks, making 1,378 sorties and attacking objectives indicated by the US command. “Taking into account the number of planes involved, we were second only to the United States. Italy is a major country, and there should be no surprise at the engagement we show in this war”, declared D’Alema. In the same year that it took part in the final demolition of the Yugoslavian State, the D’Alema government dismantled the public property of the Società Autostrade (also manager of the Morandi bridge), by handing over a part of it to a group of share-holders, and listing the rest on the Stock Exchange. The Morandi bridge collapsed fundamentally under the responsibility of a system centred on profit, the same system which is at the heart of the powerful interests represented by NATO. The comparison between the images of the collapsed Morandi bridge and the bombed Serbian bridges, which may at first seem forced, is on the contrary well-founded. First of all, the terrible scene of victims buried under the rubble by the collapse should make us reflect on the horrible reality of war, which the major medias present to us as a sort of ’war game’, with the pilot taking aim at the bridge and the remote-controlled bomb blowing it to pieces. Secondly, we should remember that on 28 March, the European Commission presented a plan of action which anticipates the repair and maintenance of EU structures, including the bridges, but not in order to make them safer for civilian mobility, but more efficient for military mobility [2 See this]. In reality, this plan was decided by the Pentagon and by NATO, who demanded that the EU “improve civilian infrastructures so that they will be better adapted to military requirements” – in other words, to be able to displace tanks, self-propelled cannons and other heavy military vehicles as quickly as possible from one European country to another, in order to move against “Russian aggression”. For example – if a bridge is not able to support the weight of a column of tanks, it will have to be reinforced or rebuilt. We might believe that in this case, if the bridge is strengthened, it will therefore also become safer for civilian vehicles. But the question is not so simple. These modifications will only be made for military mobility on the most important land arteries, and the enormous expenditure will be assumed by each country, which will be obliged to subtract the cost from its resources for the general improvement of its infrastructures. A financial contribution by the EU is planned for a sum of 6,5 billion Euros, but – as specified by Federica Mogherini, responsible for the “security policy” of the EU – only in order to “ensure that infrastructures of strategic importance are adapted to military requirements”. But time flies – by September, the European Council will have to specify (on orders from NATO) the list of the infrastructures which must be potentialised for military mobility. Will the Morandi bridge be listed and rebuilt so that US and NATO tanks can safely transit over the heads of the people of Genoa?